Let’s say you’re taking a course on the philosophy of Immanuel Kant. You’ve gone to the lectures, read your textbook, maybe a few articles, and now it’s time to start working on your term paper. You know you need to dig deeper, and you want sources that will provide insight while also helping you identify the key points of dispute about Kant, so you can intelligently enter the debate. This is when you turn to The Cambridge Companion to Kant. The Cambridge Companions to Philosophy, Religion and Culture—171 volumes at last count—provide a wealth of resources to students and scholars alike. Each one is devoted to a specific figure, period, or topic, and helps readers break into the serious scholarship on that subject. There are Cambridge Companions to Plato, Nietzsche, Marx and Jung, to Arabic philosophy, the Scottish enlightenment, and postmodern theology, to name a few. The series ranges broadly, as titles like The Cambridge Companion to Ancient Skepticism and The Cambridge Companion to Modern Chinese Culture testify. There are even a couple of surprisingly specific ones, like The Cambridge Companion to Nozik’s Anarchy, State, and Utopia. They’re ideal resources for term papers, since each volume is carefully curated to inform and advance the scholarship at the same time. The contributors are most often internationally-recognized authorities on their subjects. For instance, The Cambridge Companion to Kant is edited and introduced by Paul Guyer, the author of at least eight books on Kant, and one of the principle translators of Kant into English. 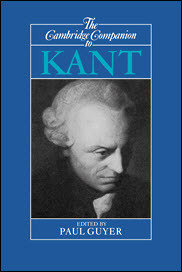 It also includes essays by a dozen other Kant experts, each focusing on a particular facet of his thought. Finally, the bibliographies at the end of each volume are ready road-maps to some of the most important literature on their subjects. Sometimes they’re even broken down into thematic sections, e.g., books and articles on Kant’s moral theory, his anthropology, his philosophy of religion, etc. So as you write your term papers this semester, give the Cambridge Companions a try. Falvey has both the print and digital editions of nearly every one.